This is a the powerful 60cc Star Fire engine. This kit contains everything you need to motorize your bike! 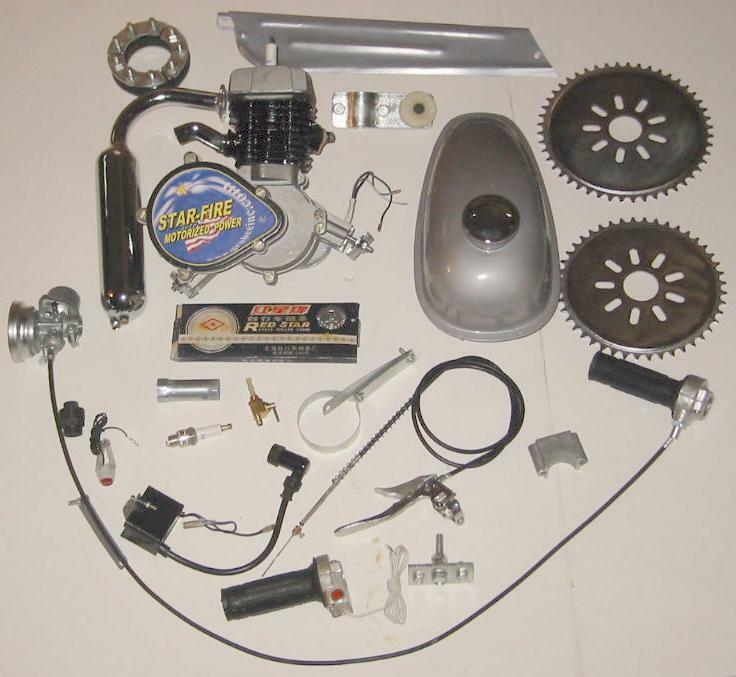 Unlike the early kits this has the Grube 9-hole sprocket kit 44 and 50 tooth (designed in part in California, for American needs). Also the improved throttle assembly. Everything is here, nuts, bolts, spare Spark Plug, adapter plate kit, Silver Tank and chain guard etc. The chrome is much nicer on these kits, steel hi-flow intake manifold (chromed), gloss black powder Coated Barrel. These are the nicest looking engines yet! Fits many bikes email or call if you have questions.